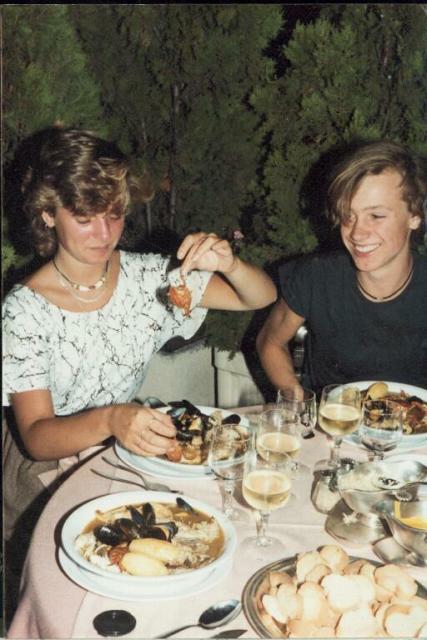 Keith and Anne enjoying a bouillabaisse in Nice. “I treasure happy memories of my daughter Anne as she grew up. There were many good times, full of fun and laughter, but the most memorable times were our holidays together abroad with her brother Keith. I remember how Anne would grapple for my hand in excitement when we snorkelled in the shallow water together admiring all the colourful fish. When they were older Anne and Keith would come and spend their summer holidays with me in Nice. Keith was completing his ‘A’ levels at the time, but Anne had decided to leave school at 15 to join a local hairdressing training scheme. I still have the photos of her laughing when she practised ‘styling’ Keith and my hair, we looked ridiculous! I vividly remember sitting in the sun one afternoon, chatting to Anne and thinking how much she had matured and grown into an attractive young woman. But whilst she was outwardly full of confidence, there was a sensitive, vulnerable side to her and I worried for her as any parent would. Later that year Anne left home where she lived with her Mother and rented her own flat. Neither her mother nor I were very happy with this or with the flat she was living in, but she appeared content with her new found independence and shrugged off any concerns we had. But out of the blue one morning she contacted me and asked if she could visit. I collected her from the station and everything seemed fine until we got back. It’s difficult to describe, but Anne kept smiling inappropriately as we spoke. I asked her what she was laughing at but she simply said “I’m just happy, aren’t you pleased to see me?” However later that night I heard crying and shouting coming from her bedroom. I didn’t sleep much and whilst preparing breakfast the next morning I noticed a carving knife was missing from the kitchen. It turned out Anne had taken it because she was ‘frightened of them’. ‘Them?’ I asked, but she wasn’t making any sense. I knew something serious was wrong. It was then that I noticed slashes across her wrist. I told her I was worried and wanted her to see my doctor, but we would have to wait until the Tuesday as it was a bank holiday. It was the longest two days of my life. I watched her like a hawk, even standing on a chair when she visited the bathroom to see she was not harming herself. When I visited her later, it was not the daughter I knew. That image of her still upsets me 20 years later. She was diagnosed with Schizophrenia and I was told she was unlikely to recover fully. The reasons behind her illness were unclear, although from discussions with my son it appears Anne had experimented with drugs. However with the support of the hospital staff and the medication she was prescribed, her condition gradually improved, and she became more stable. I remember I sat with Anne as she was seen by a psychiatrist: he spoke to her directly saying “Do you think God talks to you Anne?” She answered confidently and without hesitation, “I know he does”. It was so hard to watch the way people treated my daughter at times. I would notice staff in shops watching her, but I learnt to explain with a simple, “It’s alright, she’s with me”. At this time I was told about Rethink and began to attend their meetings. Talking to other parents and carers at those meetings helped me to come to terms with Anne’s illness and to understand it better. The invaluable information provided by Rethink about schizophrenia helped me and others in our family through a very difficult period. Unfortunately Anne’s relatively stable condition didn’t last long. Family, friends and I did our best to support Anne as she struggled to live with her illness, often feeling helpless as we faced one crisis after another. Anne lived with me for a while, later moving to live in a number of sheltered hostels, the last in Bristol near my home. She started taking drugs again and the hostel staff told me they were worried she was drinking too much as well. I decided to accompany her back to the hostel and try and talk it through with one of the staff. When we got there however they were busy, so I waited whilst Anne went for a walk. I sat there for over half an hour but the staff were in a meeting. I decided to return home and call them later about my concerns. I’d only been back about an hour when the hostel rang me. They told me the police were on their way to see me but they wanted to talk to me first. Anne had been seen climbing over the railing at the top of a multi-storey car park close to the hostel, she had fallen, and was dead. No words can fully explain the grief and the pain of that moment. Living with Anne’s illness was like living a three year nightmare, the memory of which will stay with me forever. But I try and remember the loving and affectionate daughter who was an attractive, intelligent young woman with everything to live for. It’s been extremely difficult to share my story, but if it helps to raise awareness about mental illness then it will have been worthwhile. Too often we only hear about mental illness in the media related to murder and other violent crimes, but I want to dispel this myth. The majority of sufferers are like Anne, sensitive, vulnerable people who need the care and support of others. I wanted to do something positive in memory of my daughter and to give something back to those that helped us, so I’ve decided to follow my passion for sailing and complete a Round UK Cruise to raise money for Rethink. It will be one of the biggest challenges of my life, please help spur me on and support this fantastic charity by visiting my site and making a donation. From the bottom of my heart thank you.